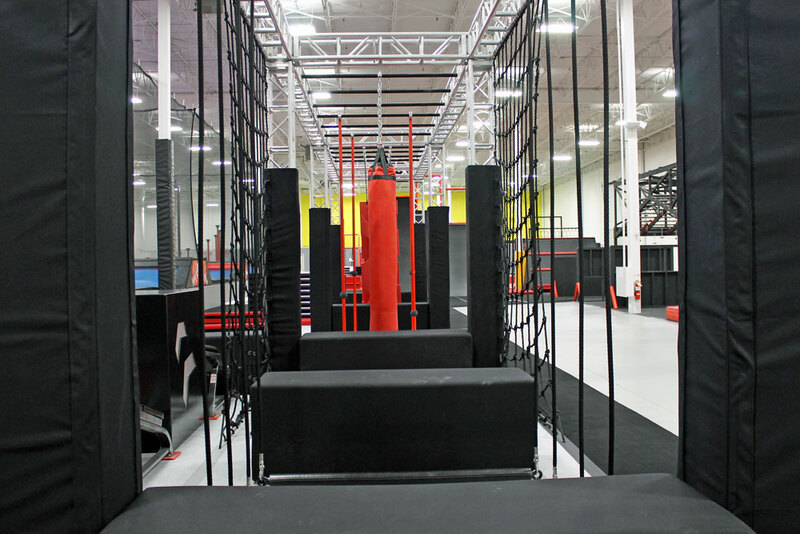 The trampoline dodgeball courts, looking out onto the Ninja Obstacle Course and the Military Obstacle Course. Photography by Karin Olafson. After paying admission, you’ll find colourful cubby holes for your boots, coats and bags. 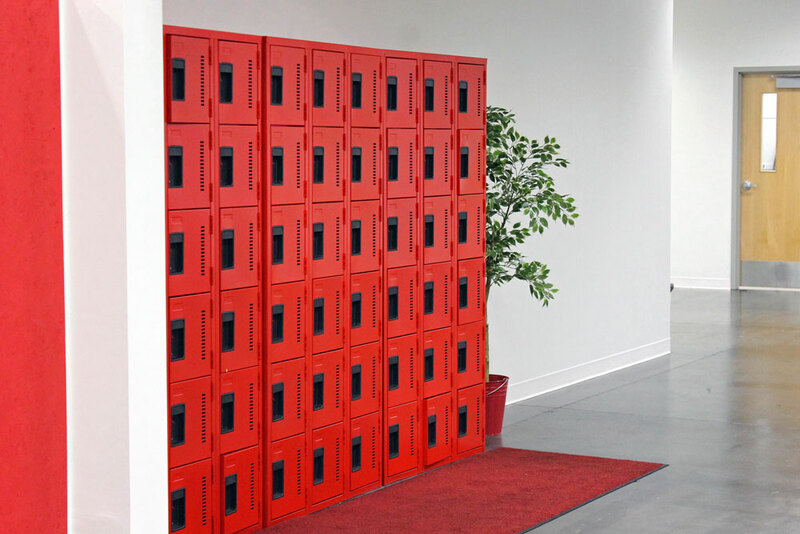 There are also lockers available for your gear. 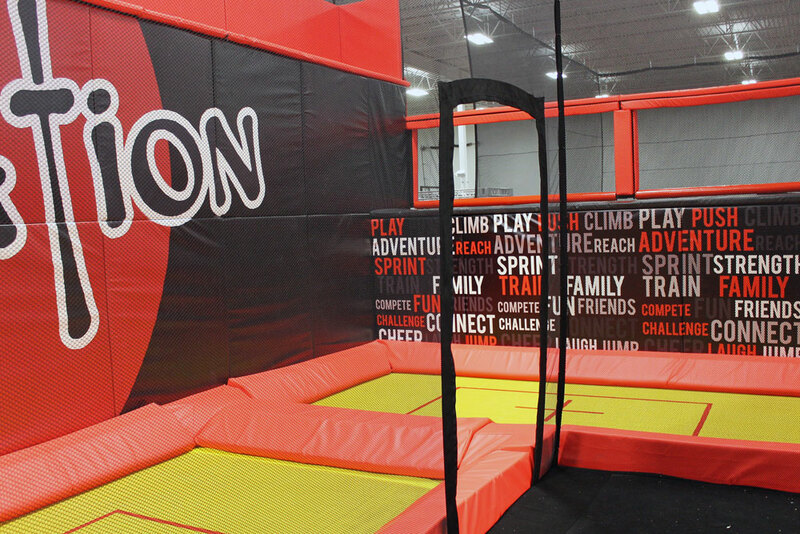 There are six main training areas in InjaNation: the Ninja Obstacle Course, the Mini Ninja Course, the Micro Ninja Area, the Military Obstacle Course, the Trampoline Park and the Climbing Walls. 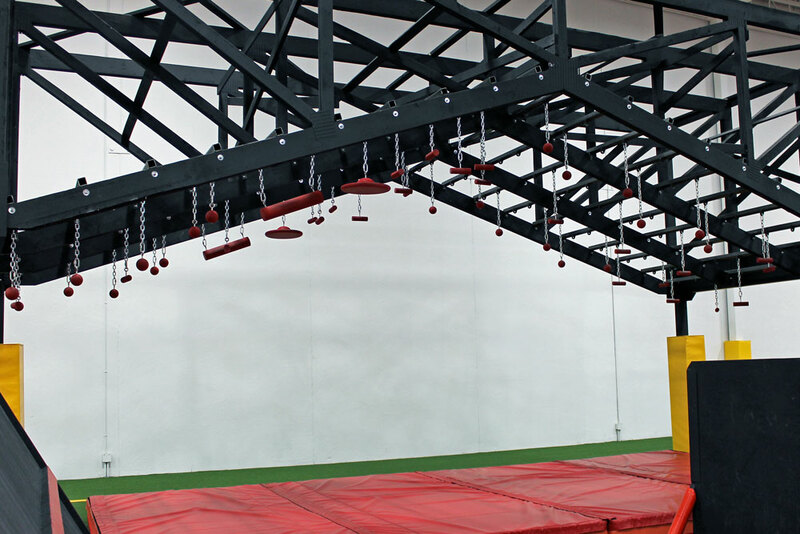 When you first enter the facility, you’ll see the climbing apparatus. The section is made up of climbing walls (there’s even a speed wall where you can time yourself and race a friend to the top) and a cargo climb (it’s a big, vertical net). This obstacle is called the Pole Climb. If you’re afraid of heights, this is a good place to start. All obstacles in this area require that you wear a harness, clipped on by an InjaNation staff member. 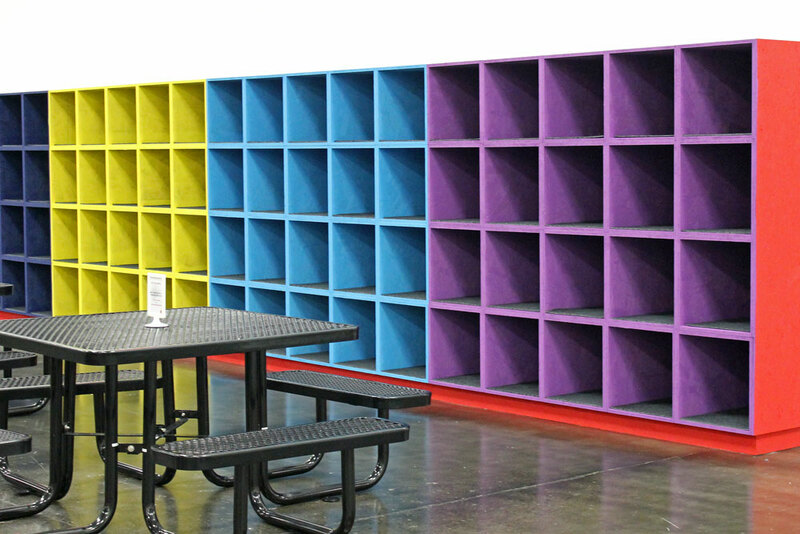 You can bring along your lunch or some snacks to eat at these picnic tables. You’ll also get a good view of the Climbing Walls (left) and the Mini Ninja Course (centre) while you take a break from training. 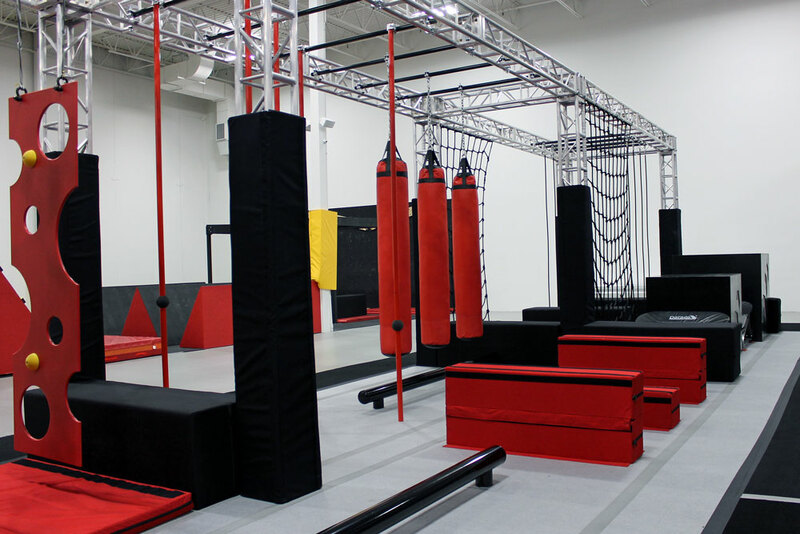 This is the facility’s Mini Ninja Course. 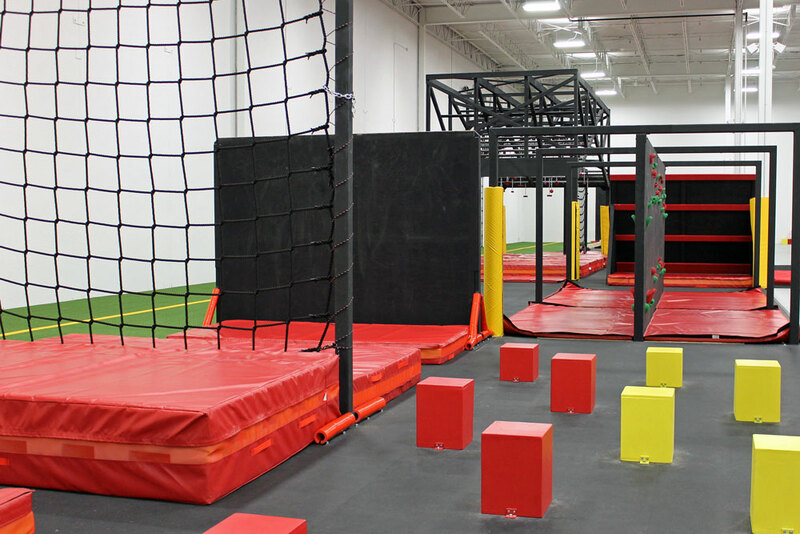 It’s designed for kids ages five to 11, with obstacles that are achievable for kids. But it’s not only for them – adults can also use this course if they are new to obstacle courses and want to try it out before moving onto the other, larger courses. If you’re interested in Reebok Spartan Races or Tough Mudder events, you’ll want to try out the Military Obstacle Course. It’s 200 feet long and was designed with input from high-performing local Spartan competitors and Olympic athletes. There was also design input from Craig Nadeau, InjaNation’s general contractor who formerly worked in the military. This photo shows a few of the course’s obstacles, including the stepping stones, a horizontal climbing wall, the reverse climb, the eight-foot wall and the vertical cargo climb. The Behemoth is another one of the obstacles in the Military Obstacle Course. It’s like monkey bars, but harder – each hold is a different shape, some are harder to hold onto than others, and some require both your hands. At its peak, this obstacle is 13 feet tall. According to Stempfle, this is the hardest obstacle in the facility. 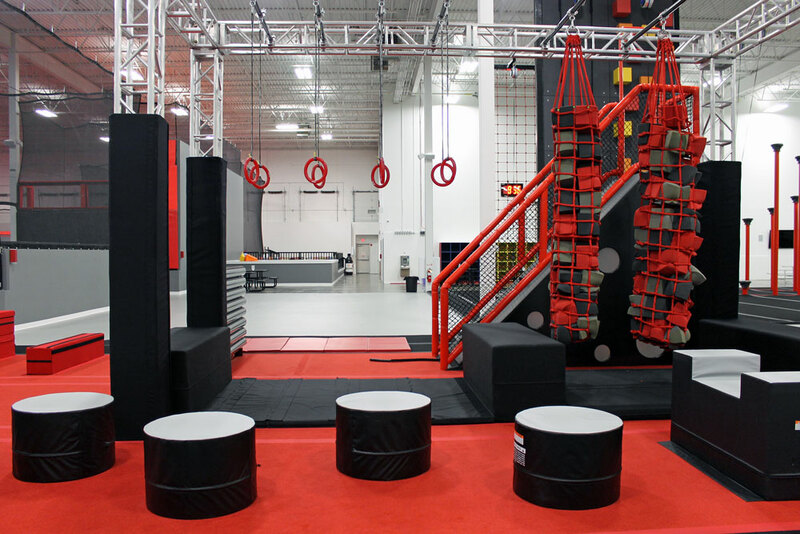 The Ninja Obstacle Course is set up between the Military Obstacle Course (left) and the Trampoline Park (right). And it’s very similar to the courses you’ve seen on television on American Ninja Warrior. This course is even set up with sensors so you can race a friend or see if you’ve beat your own best time. Pass through the yellow bars, activate the sensor and the digital timing device on the course will start running. The course has obstacles like a rounded balance beam, trampolines and monkey bars. According to Stempfle, obstacles can be added and built onto what’s already here to change it up and make it more challenging. 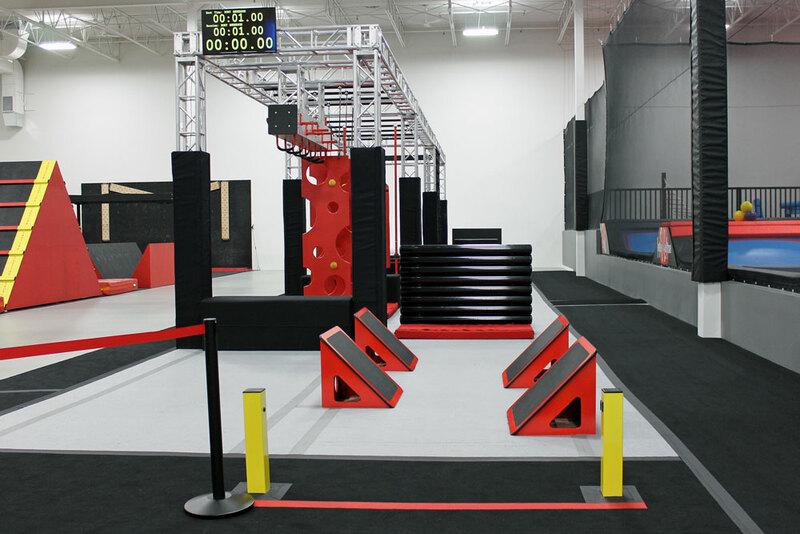 The view an athlete will get when they are halfway through the Ninja Obstacle Course. 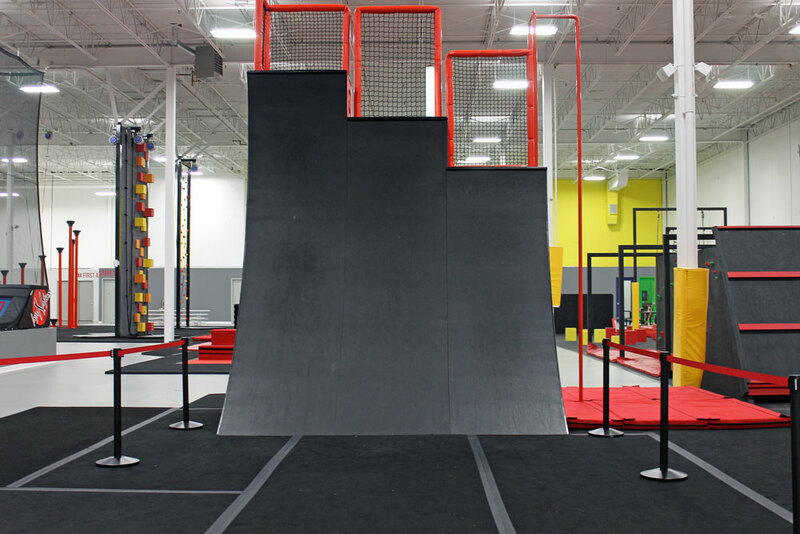 Of course, the Ninja Obstacle Course has to have a Warped Wall. There are three heights to choose from, depending on skill and experience. The shortest is 10 feet tall (right) and the tallest is 14 feet tall (left). This is the final obstacle in this course. Stempfle says there are InjaNation staff members nearby offering tips and technique advice to help athletes through this difficult obstacle. 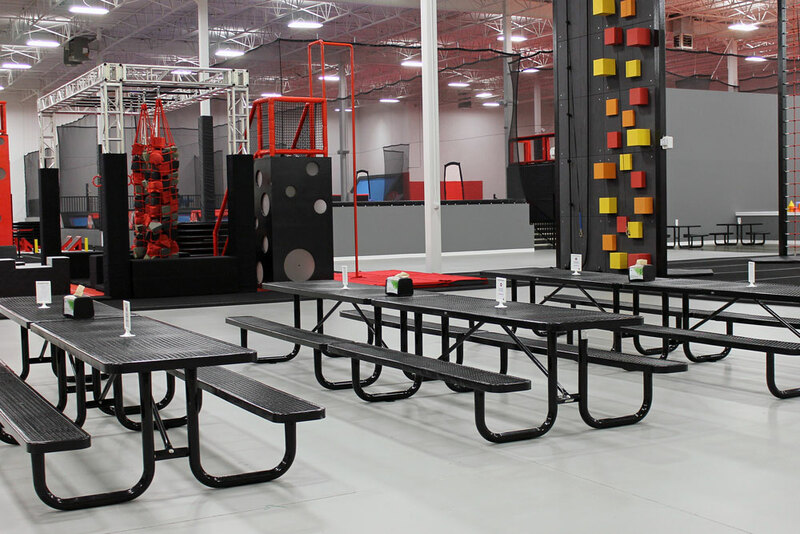 The facility also has a Trampoline Park, and this section is split up into sections too. 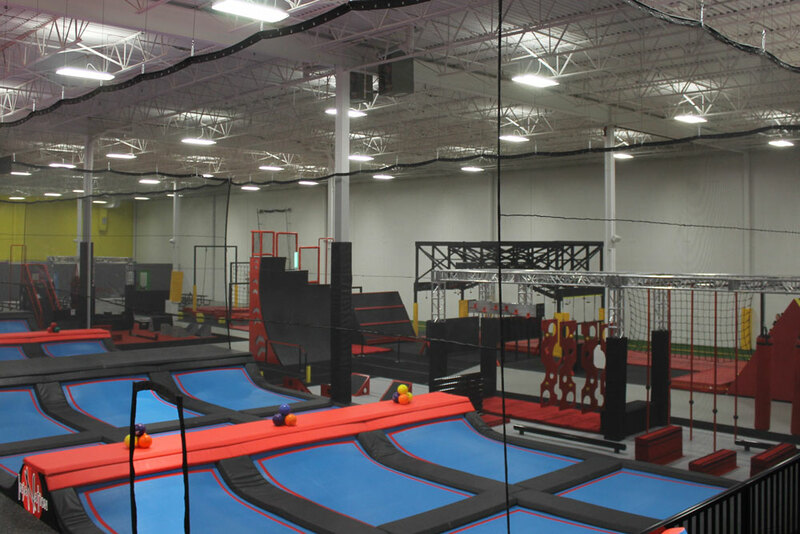 Visitors can play trampoline dodgeball (right) or warm-up on the trampolines (right). 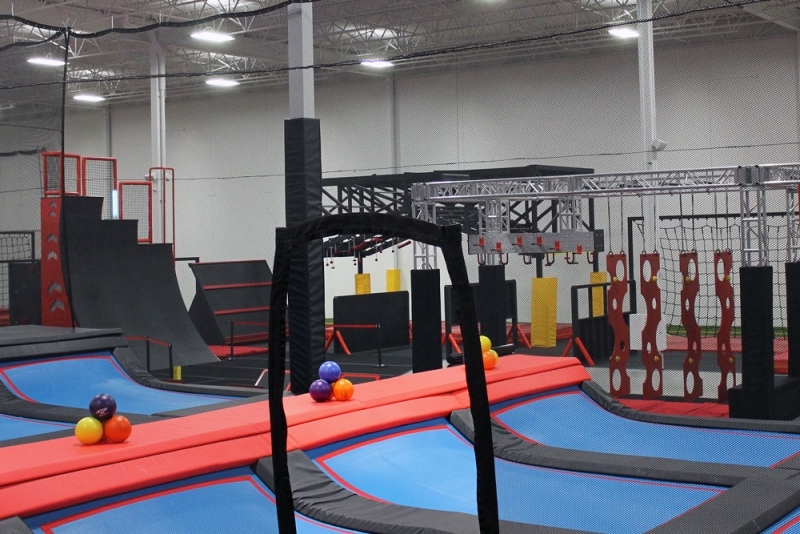 This section also has trampolines and a foam pit just for kids, a high-performance trampoline section and a foam pit section. 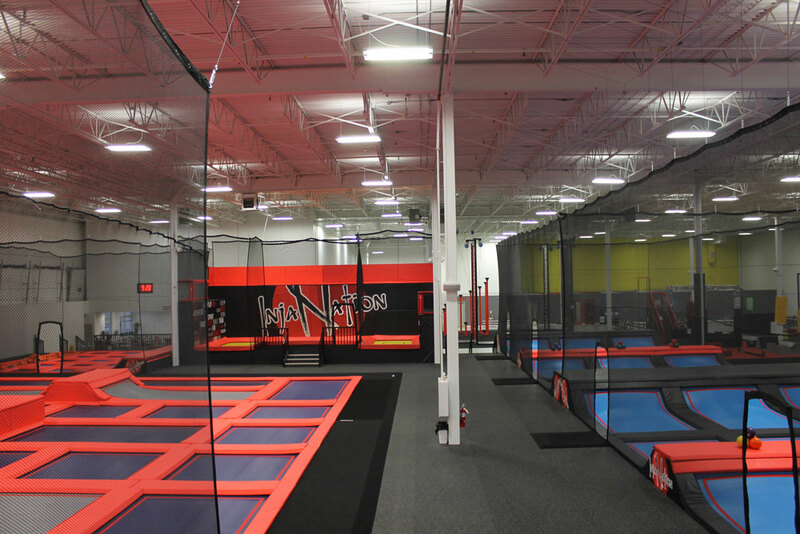 The trampolines in the high-performance section are a different kind of trampoline. You’ll find athletes doing advanced moves here. The foam pit section is just for fun. 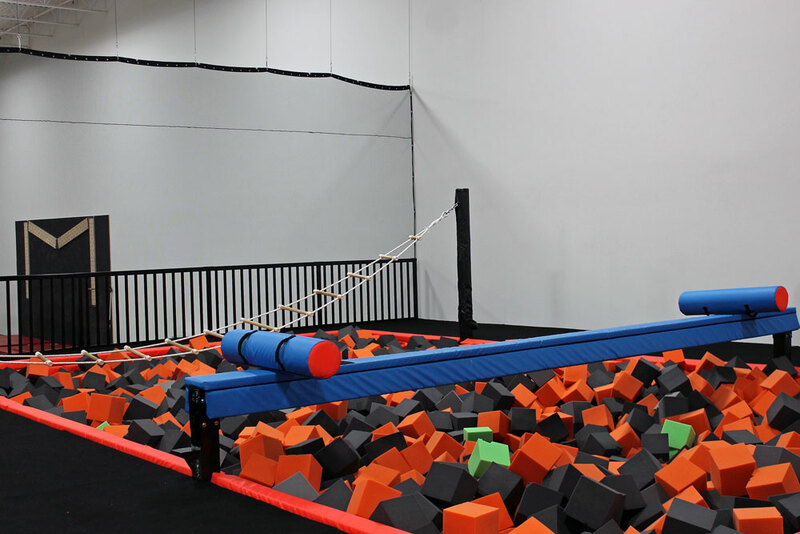 As well as the ladder and the battle beam over the foam pit (above), there’s a diving board and even more trampolines. 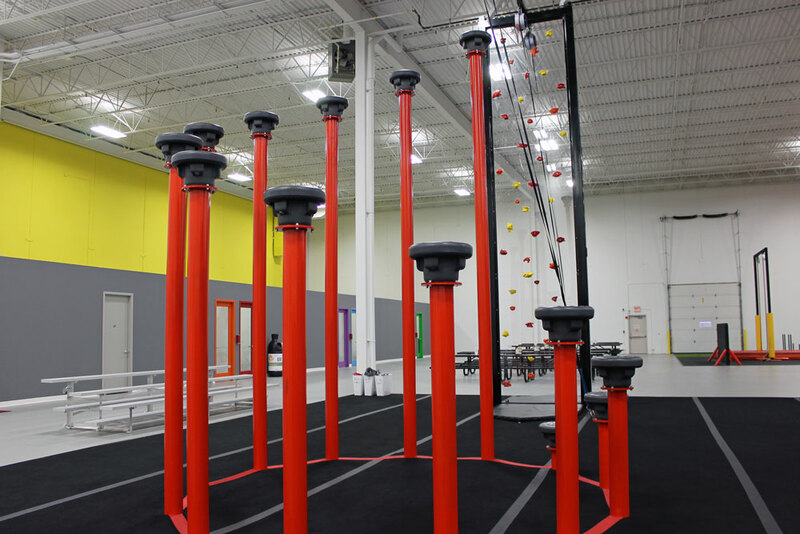 You’ll get a good view of the various obstacle courses from the foam pit in the Trampoline Park. 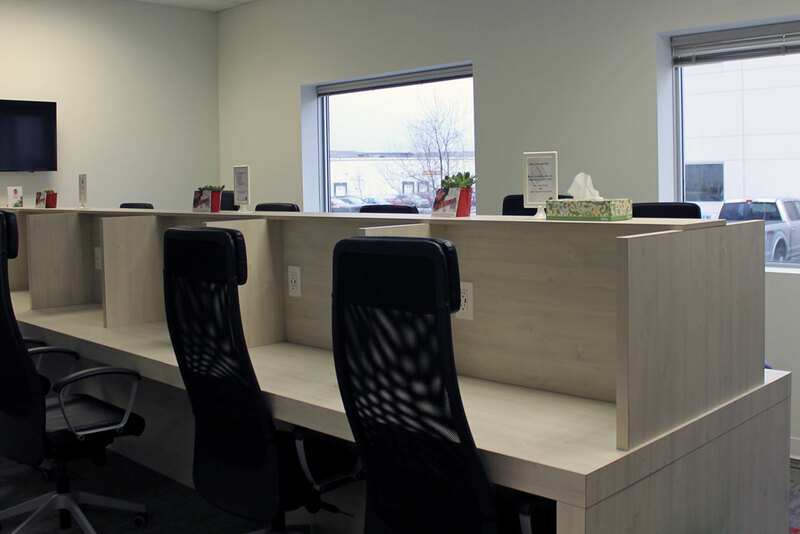 There are multiple private rooms in the facility that can be used as boardrooms or for private parties or gatherings. 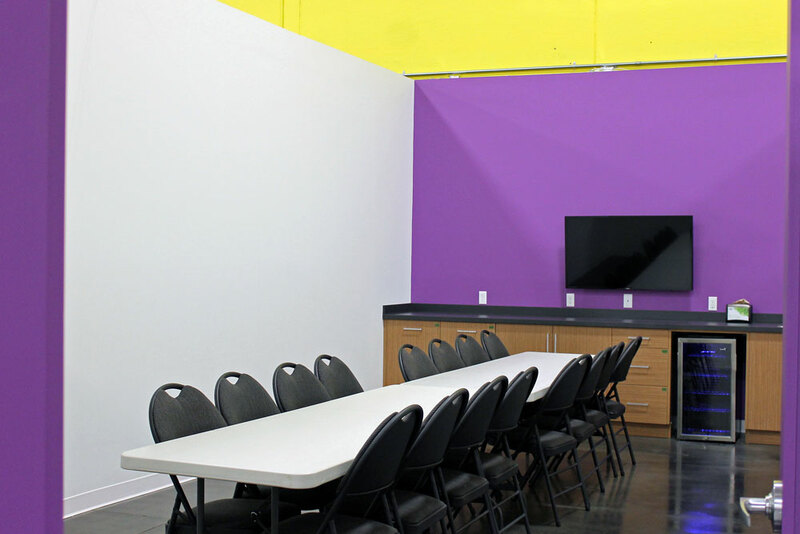 These rooms can already be booked for private events. 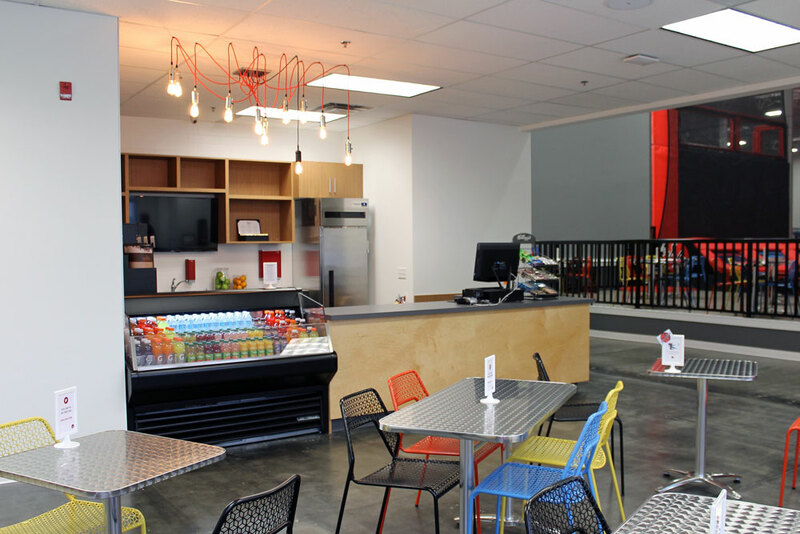 The Food N Fuel Cafe sells a range of drinks, like water, Gatorade and juices, as well as sandwiches, granola bars and other snacks. It’s located right by the Micro Ninja Area and several seating areas. There are areas and obstacles suitable for all ages and abilities, but sometimes work just has to get done. InjaNation also has a room filled with work stations.